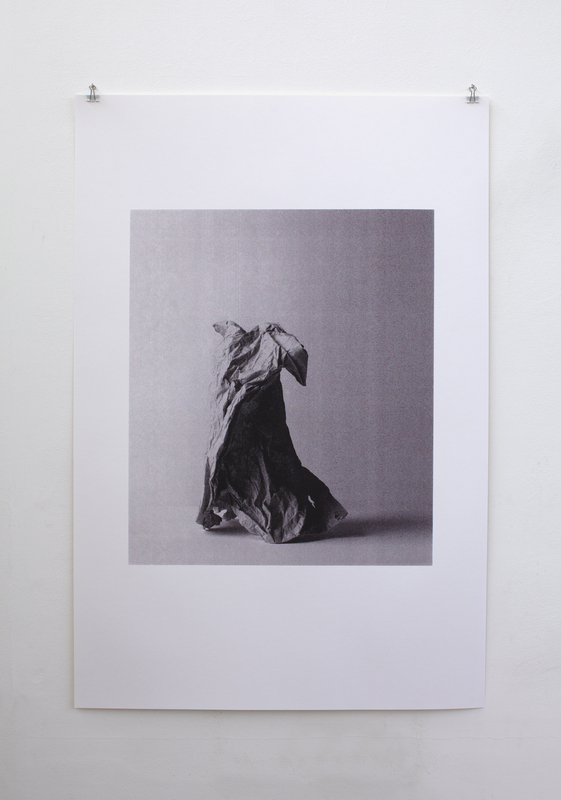 Slade MA graduate Alex Ball created the outline of a beheaded Kore, a sculpture of a female figure, in Paper (2012), from a large sheet of stiff paper, folded and crumpled up to create the figure’s drapery, reflecting the fragility and emptiness of these times, or perhaps the figure is simply elsewhere, unrobed, and we are presented her garment, suspended in animation, frozen in time. Similarly Meekyoung Shin‘s work, Kuros Series, exhibited at Haunch of Venison in 2011 brought together a collection of Greek figurative sculpture in a single room, only if they had been buried in antiquity, as is how many such works survive today, they would have surely washed away, because Shin’s works are made of soap. Both Shin and Ball’s choice of ephemeral materials critiques both the preciousness and value of works of art, as well as their longevity and ability to become long-term museum objects. 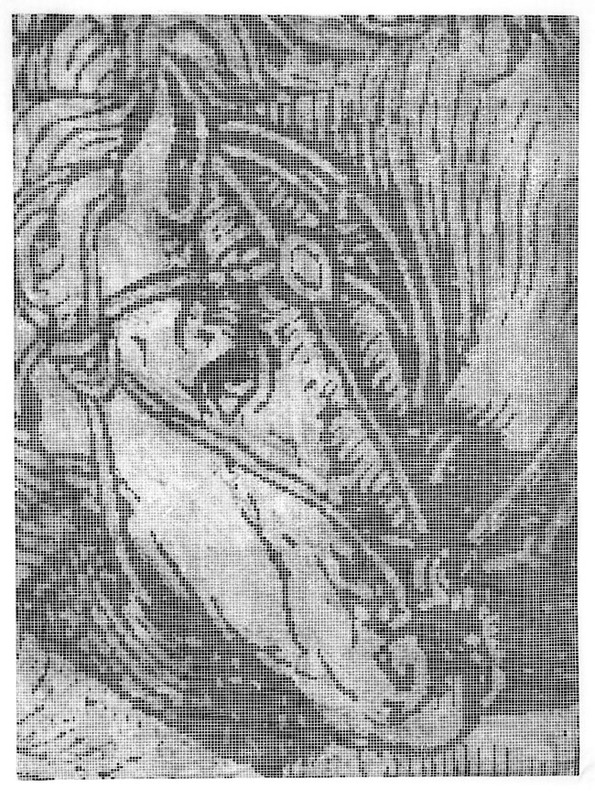 Jolanta Rejs‘ woodcut prints in the Royal Academy Schools Show include what could be a Trojan horse in Apocalypse in fragments (After AD 1511) No. 6 (2012), depicted in a grid form that seems it should be the cartoon design for part of a great tapestry depicting a mythical scene, the texture of the ink bringing to mind the mesh of a silkscreen. These are curiously printed on transparent or tracing paper, surely similarly making them a conservator’s nightmare, with a limited life span. Whilst the content of John Robertson‘s paintings, also in the Royal Academy Schools Show, slightly slips away from the theme of classicism, they are likewise on a transparent surface (polythene that has a similar appearance to transparency paper), wrapped around stretchers so as to reveal their inner structure. These works reflect a desire for political transparency within the economy, banks and media. Furthermore Robertson’s Caesura (/) seems to hint at deletion or erasure (of debt perhaps) and to reference Lucio Fontana‘s slashed canvases, whilst relating with his other works tessellating letters, including one which seems to either go ON and ON, repeating history without changing it, or to repeatedly say NO in protest, perhaps against changes to work conditions. 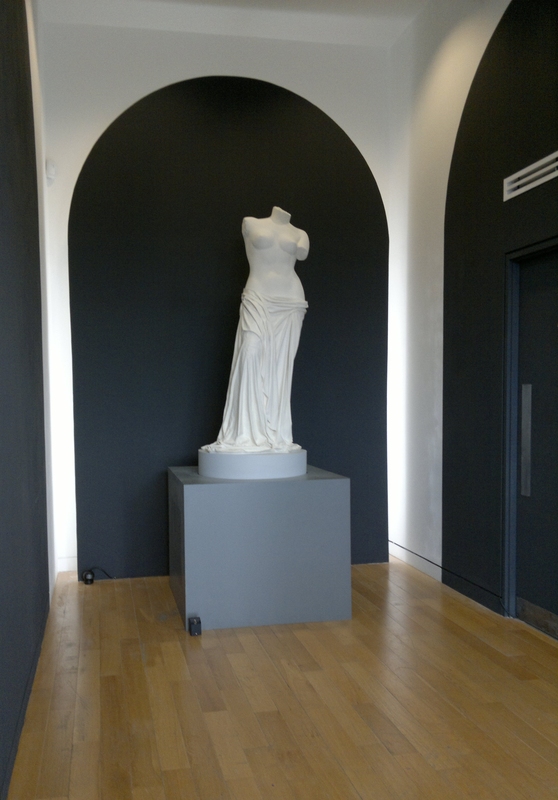 As already discussed of Lyons’ Ironic Piece of Work by Female Artist (2012), some students also focus on the museum display of classical sculpture. 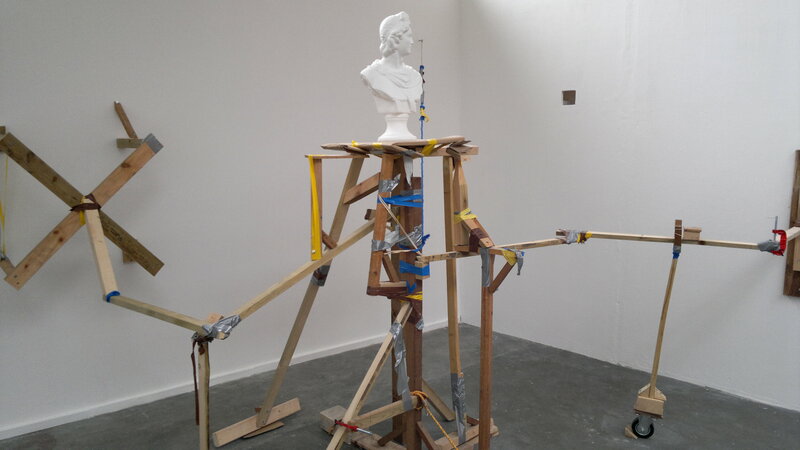 Luke Nairn created a temporary bodged plinth or platform for a Romanic plaster bust at Camberwell (BA Sculpture), recycling found timber. This results in a sprawling many-limbed figure that leans against and clings to any surface it is able to. This is like a three-dimensional rendering of a sketch of a stick man, akin to Will Alsop’s scribble on Goldsmiths’ Ben Pimlott Building. Nairn’s structure is bound with variously coloured tapes, ropes and fixings, whilst the surface the sculpture sits on is actually a folded over cardboard box, propping the piece up like you might use a book to adjust the level of a projector. This reflects the make do and mend attitude of these austere times, reminiscent of the 1940s, and the everyday makeshift adjustments captured in Richard Wentworth‘s photographs. Meanwhile in Luey Graves‘ Painted Wooden Structure (2012) at the Royal Academy Schools, a relic figure appears trapped in a glass case like Sacagawea in Night at the Museum, desperate to get out into the world. 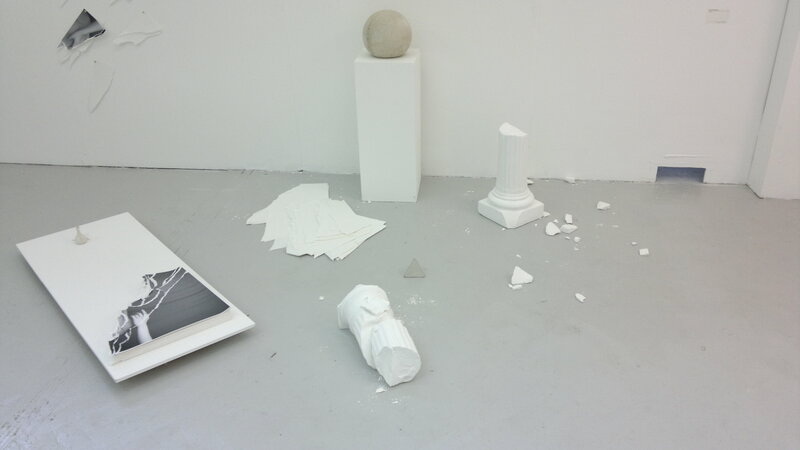 Finally we might extend this collection to include Julia Parkinson’s sculptural installation in BA Sculpture at Camberwell, to reflect that today’s art graduates are looking to other ancient civilizations, perhaps in search of a less divided, unsettled or simpler way of life. Parkinson’s In Conversation (2012) resembles either the space between the Aztec temples of Tenochtitlan, or part of one temple or an Egyptian pyramid inverted, partially covered by a sandstorm and rusting away as nature slowly reclaims man’s forgotten shrines. Meanwhile it could also be a stadium for watching sport such as boxing or wrestling in at Mount Olympus, with stepped seating like an amphitheatre but in a square, fully surrounding format.